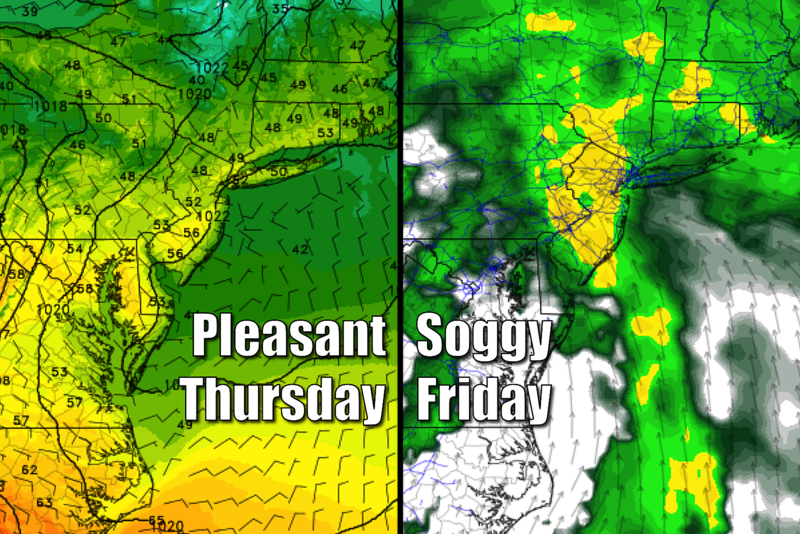 A moisture-rich storm system will deliver periods of heavy rain to the Garden State from Friday through Saturday morning. And I've been promoting a nice Thursday too — a forecast that remains mostly true, aside from a few hiccups. Temperatures are chilly to start, mostly in the 20s and 30s across New Jersey so you'll certainly need a jacket through the morning hours. Sunshine will warm us up quickly Thursday morning, with clouds gradually increasing through Thursday afternoon. High temperatures will reach the lower 50s across the Garden State. Yes, that's a few degrees cooler than Wednesday, but we lose the stiff breeze Thursday. Model consensus suggests a shower may drift into (mainly northern) New Jersey sometime Thursday afternoon or evening. Even though our air will be very dry throughout the day, every model paints at least a few raindrops over the state. I just don't want to rule out the possibility, although I think you can safely skip the umbrella. Our weather will take an even bigger toward "wet" overnight. Showers will become more and more likely Thursday night, especially after Midnight. It's going to be almost exclusively rain, as low temperatures dip into the upper 30s to lower 40s. However, in and around Sussex County, temperatures both at the surface and aloft may be cold enough to sustain a period of sleet and/or freezing rain. While snow accumulation is highly unlikely, there could be some slippery spots early Friday along and north of Interstate 80. As this storm system draws closer, rain will increase in spread and intensity by Friday afternoon. It's going to become pretty windy too, sustained at 15 to 25 mph. Periods of moderate to heavy rain are in the forecast through Friday evening and Friday night too. While the threat for severe thunderstorms will remain low from this system, downpours may be torrential enough to cause flash flooding of low-lying and poor-drainage areas. Everyone in the state will almost certainly see over a half-inch of water in the rain gauge. Rainfall totals may exceed 2 inches where it really pours. Showers will wrap-up sometime Saturday morning. 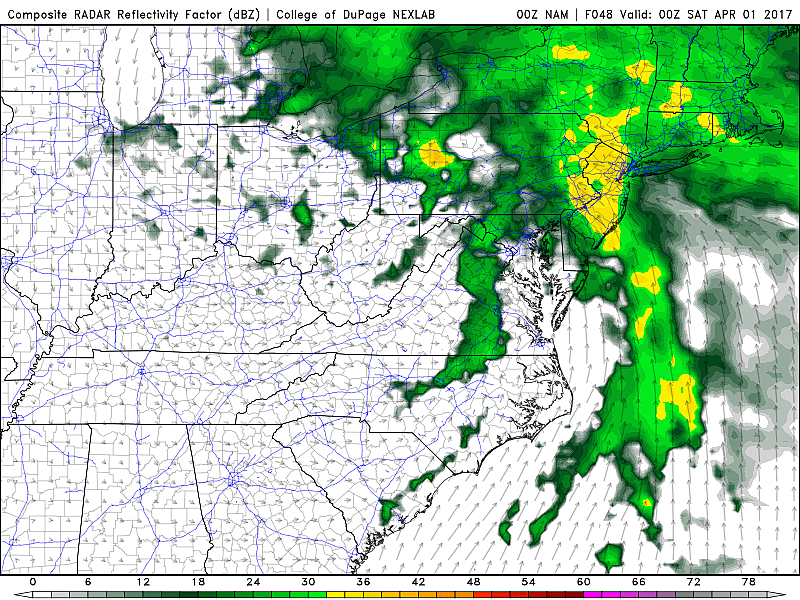 (NAM says we're done by 8 a.m., while GFS keeps a few raindrops around through 11 a.m.) And then skies will clear through Saturday afternoon. In fact, our weather will turn much nicer through the rest of the weekend. Saturday's high temperatures will be in the lower to mid 50s, with Sunday bumping into the mid to upper 50s thanks to mostly sunny skies. Normal highs for late March and early April are in the mid 50s, so we'll certainly call this weekend "seasonable". Our next storm system of note is scheduled for Monday night into Tuesday. Another potential soaker. 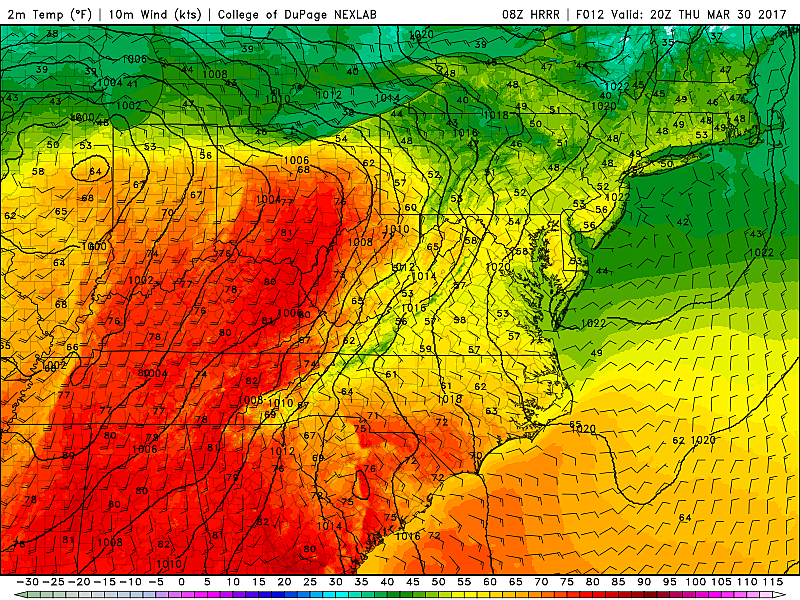 And a better chance for thunder, lightning, and marginal severe weather due to warmer temperatures.